Heavy rainfall last week caused rapid snow meant that has resulted in major flooding in parts of Nebraska, Iowa, Missouri, Wisconsin, and Illinois. At least three people have died thus far, and hundreds of homes, businesses, and farms have been affected. Estimated farm losses could top $1 billion. Mandatory and voluntary evacuations are in place, and parts of 15 states are under flood watches and warnings, according to CBS News. According to the U.S. Army Corps of Engineers, 200 miles of levees have been compromised in four states and historic flood levels have been recorded at 42 locations across six states. 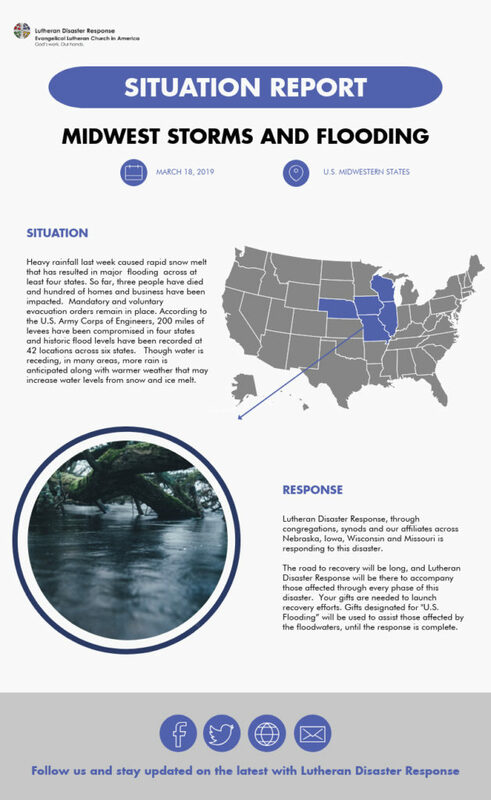 Lutheran Disaster Response, through congregations, synods, and affiliates across Nebraska, Iowa, Wisconsin, and Missouri, is responding to this disaster. 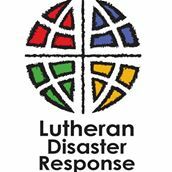 The road to recovery will be long, and Lutheran Disaster Response will be there to accompany those affected through every phase of this disaster. Your gifts are needed to launch recovery efforts. Gifts designated for “U.S. Flooding” will be used to assist those affected by the floodwaters until the response is complete.